The short term weakness outlined in yesterday’s currency market analysis for the euro vs dollar was indeed confirmed in the currency trading session, with the pair closing as a wide spread down candle with minor shadows to both top and bottom. Whilst the low of the day found support from the bunched 9 and 14 day moving averages, this can, to an extent, be discounted given the sideways price action of the past few weeks. However, the 40 day moving average still remains valid and until this indicator is breached with a break and hold below we can assume that the bullish sentiment remains firm for the time being. 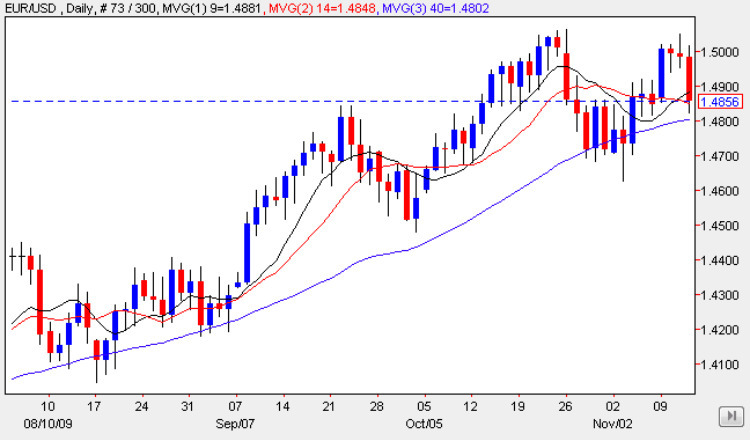 The key technical level in the short term remains the 1.500/1.505 price level, and until we see a clear break and hold above this level, it will remain a defining level on the daily chart and a potentially strong level of resistance that has to be breached if we are to see the current bullish momentum maintained in the medium term. Below of-course, we have several levels of potential support should we see the bearish sentiment build further, and the first of these is now directly below in the 1.4850 with a further level at 1.48 followed by the primary platform at 1.47. Should all of these be breached then we could potentially see a much deeper move possibly as far as back as the 1.43 price handle in due course. Today’s fundamental news on the economic calendar for the Euro has been dominated by Preliminary German GDP and Flash GDP for Europe which although confirm that the Eurozone is climbing out of recession the numbers of 0.7% and 0.4% were lower than expected and behind the US. Meanwhile in the US the market waits for the trade balance numbers which measures the difference in value between imported and exported goods and are expected to come in at -31.8bn. The other significant item will be the UoM (University of Michigan) Consumer Sentiment Index which is forecast at 71.1 and is considered a leading indicator by traders and investors.